The first “Archaeological Bayuda Conference” was held from 10 to 12 September 2015 at Münster University. The proceedings of this event present the current state of archaeological and cultural-historical research on the region. This book is, therefore, the first comprehensive collection of archaeological research on the Bayuda. Part I is devoted to the results of the initial ‘Wadi Abu Dom Itinerary’ survey project, which ran from 2009 to 2016. In part II, further substantial research in and about the Bayuda is published, adumbrating as well as highlighting the high archaeological potential of this region. 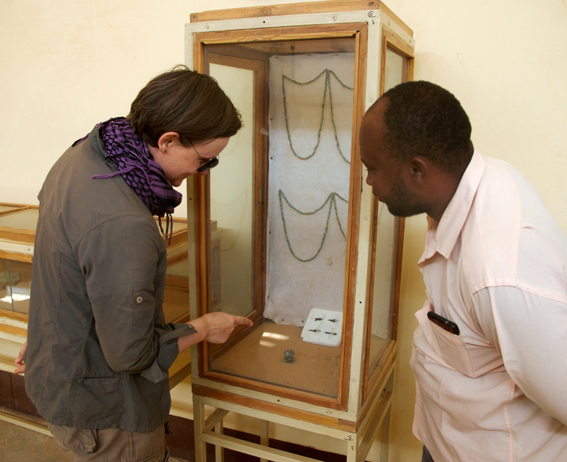 After the temporary exhibition „Tod und Ewigkeit“ at the Archaeological Museum Münster, the finds of the 2015 funerary excavations which were restored in cooperation with the Hochschule für Technik und Wirtschaft Berlin have returned to Sudan. 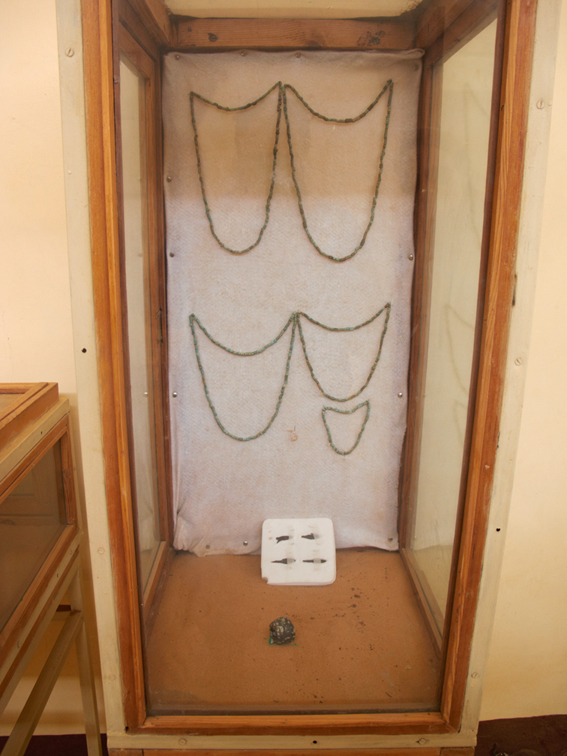 The find convolute consists of arrowheads made from iron, an archer’s ring, and a large amount of faience beads (which are now – as one possible reconstruction of their initial appearance – assembled as a necklace). Since autumn 2017, the finds are part of the public exhibition of the Archaeological Museum Karima near Gebel Barkal. 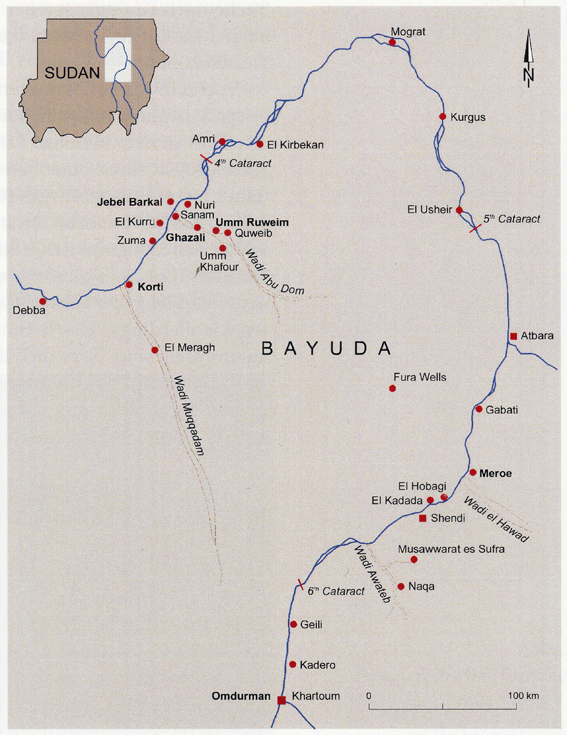 Bayuda is the name of the region defined by the large bend in the Nile’s course between the cities of Omdurman and Korti. The desert-like landscape is characterized by stretches of gravel and boulders as well as by extensive expanses of sand. In the middle of Bayuda there is an impressive volcanic region – wadis that transport the annual rainfall to the Nile originate here and from a few other mountain ranges. The most important of these channel-like valleys are the Wadi Muqqadam and the Wadi Abu Dom. The focus of our project is the latter wadi of dendritic origin which is located somewhat south of the volcanic region and runs then in an approximately southeasterly to northwesterly course to the Nile. 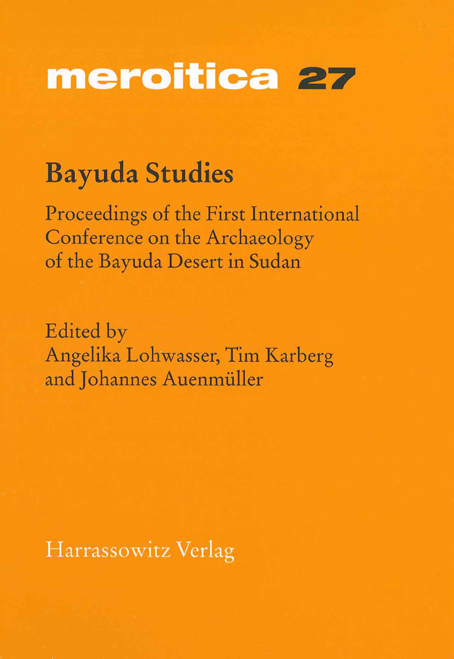 Until the initiation of our project, the large region of Bayuda had been scarcely explored archaeologically; a survey conducted in 1952 approximately from Damer and Abu Hamed by O. G. S. Crawford produced the first indications of sites with antiquities. At the conclusion of that expedition, four days were devoted to a detour from Damer into the interior of Bayuda. Then in 1942, H. N. Chittick and P. L. Shinnie travelled through Bayuda from Meroe in the direction of Shendi. In their report they included sketch-like plans of the structures at Umm Ruweim, Umm Quweib, and Umm Khafur in Wadi Abu Dom. Thereafter P. L. Shinnie excavated and published the monastery at Ghazali which is located in the lower part of Wadi Abu Dom. Following on Shinnie’s excavations, Bayuda was for all intents and purposes forgotten, archaeologically speaking, until the later 1990s. The Sudanese Antiquities Service (NCAM) carried out a test clearance of a tomb (empty of finds) at Umm Ruweim in 1989, but it would be 1997 before T. Kendall undertook a survey of Wadi Muqqadam in the southern part of Bayuda. Beginning in 2009 H. Paner of the Archaeological Museum, Danzig, has conducted a survey by automobile of the entire area of Bayuda with the goal of mapping the larger sites. 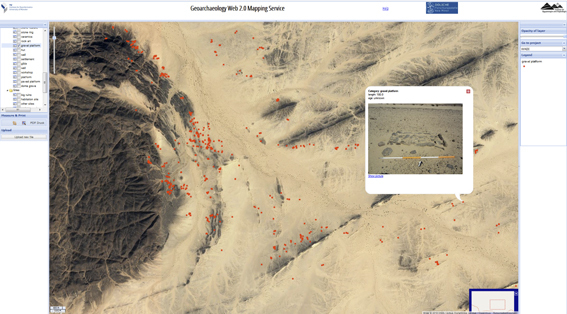 In the same year Paner initiated his survey, the project “Wadi Abu Dom Itinerary” began exploring and documenting in detail the evidence for human activity there.